Firsted, Miss Megan from Down Under asked what we do to keep Derby or Ducky from burning their paws on the stove top. Well, mum usually only uses one burner at a time and as soon as she is done, the tea kettle gets moved on top of the warm burner. This keeps us from stepping on it while it cools off. You can see that the hots are going and the water is cooking some noodles. Then the little tea kettle gets moved here and you can see the red light behind showing that it is still hot. However, Derby did do this years ago.Here is one of the posts, but there is one before this one and several after talking about when he likely burnt his pads slightly. After than mum started with the kettle thing. The Katnip Lounge's mum wanted to know about rolling the yarn into a big ball. Well, mum says that some yarns are put together and sold where you can gently pull out the yarn from the inside out. This is not one of them. She would rather take the time to roll it into a ball. It takes up less room in her bag and on the couch. Plus then she can check it for any snags and such too. She says this is a cheaper type of yarn and not her main brand that she likes. But she liked the colors so much that she bought it. So we hope this answers your questions! They better have a special door or gate for us, we are priviledged bunch. This winter will not give up, more snow overnight and Derby decided to lick some of that white stuff off of mum's outside boots. Nice and cold, and just hits the spot fine. Not to worry, mum does not use salt and stuff so it is pure snow he gets to lick. We had a nice treat time with mum yesterday. Seems all the beans were discussing treat containers on FB, so mum got some pictures and then of us getting some treats. She doesn't dare open that container and NOT give us some treats. Derby taking the treat and nearly mum's fingers! Ducky, being gentle when he takes a treat. Back into the deep freeze this week. Mum says she has to go into the office this week, seems there is a big meeting she has to be at today. Trust us, she would rather be home in the nasty cold. Well they played the Pro Bowl All Star game on Sunday. Who cares! Now for a week of hype leading up to the Stouper Bowl next Sunday. Yay, we made it to the weekend! 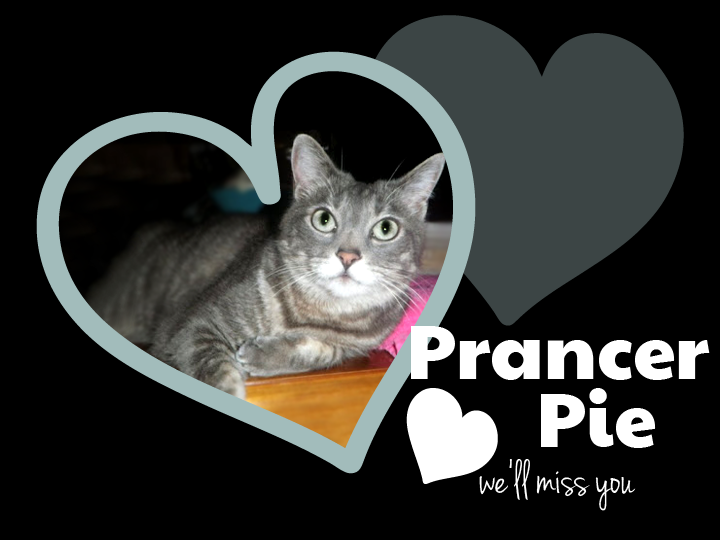 First we want to send out purrs to Prancer Pie's family. He ran off to The Bridge after not feeling well for a few weeks. Comforting purrs to them. A while back we won a time tunnel from Savvy and it arrived fast, but mum has let the package just sit and didn't open it for us! Savvy even frantically left us a message to make sure we did get it. So since we did get it, we better show it off. Here is the time tunnel all packaged up, then mum used her thumbs to open it up. Derby going in for the first time. Ducky taking the same path. Mum being sneaky and taking a picture down the tunnel where you can see the dangely toy. On the way out! Mum even thinks she has a good spot for the tunnel where she can leave it out and it won't be in the way all the time. 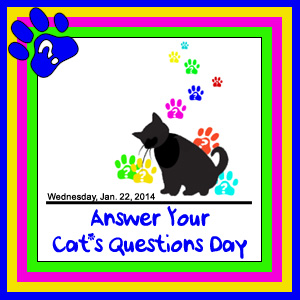 It is ask questions of our beans day, so I, Ducky, will be asking the question of mum. Derby did this a few years ago, and he got all into a funk. That won't be me, I don't think I could ask anything of mum that would make me unhappy. Ducky: Hello Mum, I am happy to have the chance to sit with you. Mum: Ducky I am happy to sit with you any time. Ducky: I really only have one question for you. Mum: Really? Just one thing you want to know? Ducky: Yep, just one thing. Ducky: Why do you love me so? Mum: I love you because you are the sweetest and most loving little mancat I have ever known. You captured my heart four years ago, your purrs, soft fur, gentleness. Well just everything about you really. Ducky: Oh wow, you hesitated and got all leaky eyed. I figured I had done something wrong to make you be upset. Mum: No I am not upset, just feeling how much I love you. Ducky: I loves you too Mum. Well mum is headed back to day hunt today. She spent a lot of time this weekend, chillaxin' and napping. We both had a wonderful nap with her on Caturday. She is learning to unwind with us. Plus she tried not to do too much, her main thing was to work on the crow-shay. So she took a few minutes of video to show how helpful we are with the yarn. Plus you can see the blankie she is making. 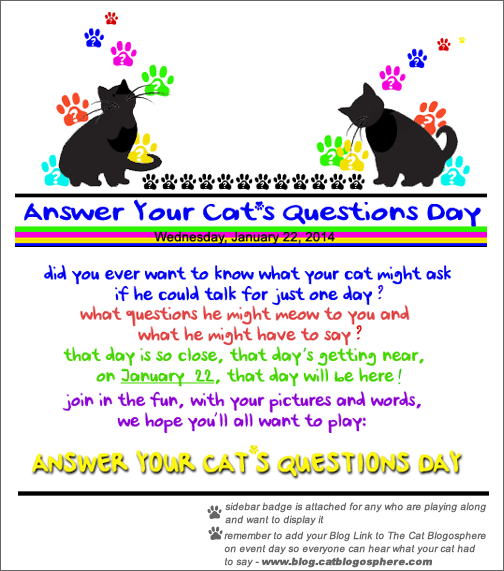 Come by on Wednesday as Ducky will be asking mum questions. 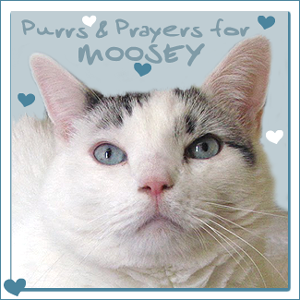 Sending purrs to Moosey that he get better soonest. He went off to the ER vet this weekend. Plus a few spare purrs for mum's furiend Miss Lynn. She is off to get a second opinion on something that is funky near her one eye. It is getting so it is growing around her optic nerve. Mum is sending lots of prayers, we are doing our purrs. AFC - Our Bronco team and fav player Mr Peyton beat the boys named Pat and are on the way to the Stouper Bowl. They played well and mum did no yelling at the moving picture box, just a few yeahs and claps. NFC -The game went down to the last minute but the team we wanted to win this game, the Seahawks and the Bucky Badger alum at QB. Sorry Niners, time to go home this year. Looking forward to the Stouper Bowl this year as we actually have a couple of teams we like playing. Happy Caturday! We are happy as we have had two extra mum days this week. She didn't go day hunting, said she needed a break. She had to be home while some work was done here, more pump stuff from last week and the dungeon work. More on that some other day. She also has been spending time working on her crow-shay. She was getting down to the last of the ball of yarn, so it was tempting to play with it. Derby, being an old fart cat, just would sit there and watch. The mum got out the new one that she will make into a big ball of yarn. Here is the big ball of yarn, something more to play with! We hope everyone has a wonderful weekend. We will be watching feetsball tomorrow to see who gets to play in the Stouper Bowl! Time for some cat yoga, gotta stretch and stay limber. Yes, mum, I quit when you started to take pictures. HiYa, Ducky here. Oh yeah, we jump all over, but mum is OK with that. She knows we are on the kitchen counters. She just cleans or gets an all clean one out from the cupboard. Derby walking across the stove top, mum had not been using it to cook. In fact he was sitting on the hot pad protector. Mum had used the hot-as-hell-box but the top was still cool. Yeah, so what, I will walk on the counters. Me, just hanging out on top of the tower! NFC - The gold digging Niners will be headed north to see if they can win against the Seahawks. I think mum will want the Seahawks to win, their QB used to play for Bucky Badger. AFC - Our fav Mr Peyton and them Broncos beat the Bolts and will host the guys named Pat. We hope everyone has a good week. At least we won't be in the deep freeze this week. We made it to the weekend and through the deepest of freezes this week. But more things happened for mum this week, but that can come later. We have been having lots of naps and such while it has been cold, but it is now amazingly above freezing! So a swing of 45 to 50 degrees from Monday to Caturday! However it got super slippery on last night, so mum was happy to make it home safely and be home. Thursday night we were all cuddled up and ready to go to bed when the dinging dong door bell rang and mum found a box outside. Filled with her little oranges to eat all the way from Florida! These got seperated out as they were super hard, most likely slightly frozen. They didn't go in the cold box right away so she could check them. She found the box may have been on the cold truck for over 12 hours! Sheesh, that is no way to treat this stuff, but one of those things that happen when it gets cold out. Mum says probably warmer than sitting outside our door all day long. All stuffed into the cold box. We will take what is near the top in those tubs. HAM! Oh and the other bother for mum? Well Friday night a buzzer went off in the dungeon, the pumper that pumps the water out died. (RIP little pump). But it is thawing so this pump as gotta work or it will mess up the dungeon work that mum just paid for. Soooo, mum spend green papers to get the guy to come out yet on Friday night to replace the pump which meant spending extra green papers to pay the after hours charge. The after hours charge would apply to all weekend, so might as well get it fixed and sleep easy! So we hope you all have a good weekend. We are going to mess about, nap, watch fevvers and snuggle with mum. We have been doing lots of this, napping, cuddling, sleeping by the heaty spots. It is getting better and mum day hunted from home again. Tuesday AM when she got up it was this cold outside, which was colder than the day before. Sheesh, enough already. But mum did open the back so we could see outside during the day and get a little bit of natural light into the house. Middle of the afternoon it finally got to zero, positive, but just barely! As we snuggle tonight it got colder, now is is slowly getting warms again, but still just negative. We hope everyone is good, staying warm, nothing freezing. Soon this will be gone. On Sunday morning it was this warms out and it stayed about this and slowly dropped all day. Before we went to sleeps last night it was down to minus four and getting colder over night. We will have mum take a picture tomorrow and post later on what it got to. So what have we been up to with the cold weather? Mum was working on a crow-shay blankie that will help keep her lap warm while she works on it. She did this while the feetsball game was on yesterday afternoon. The Pack - well they didn't get blown out but didn't win. Mum says she wasn't expecting them to win as they have been a so-so team all year. Heck back on Turkey Day they stunk up the stadium so bad it wasn't funny. The weekend is here and right now we are having a heat wave! All of 29 degrees above zero. Now last Caturday it was in the 40's, but by Monday we may be getting some of the coldest temperatures of our short lives! Mum says she remembers back to the two days when the coldest temperature ever here was set at -26 degrees F. That would be - 32 degrees C for our metric fans. Either way, nasty cold. Mum says on one day she had to work, her car didn't start and her then neighbors gave her a ride! The other day she could just stay home. We are enjoying our tower. Here we both have spots claimed and watching outside to see the fevvers and sqwerls, or anyone who happens to venture by on the trail in the snow. We even hang out there if mum as closed off the view to keep the warms in the house. But we both have claimed the high spot. Just depends on who gets their first or if we can bug the other guy to leave! Be warms and safe, mum says she is "in" until the nasty cold stuff goes away. Says she will work from home on Monday!